If Liberace had been a city instead of a flamboyant, glitter-struck, "one-man Disneyland", he would have been Las Vegas. In fact, if you know anything about the history of Las Vegas and the history of Liberace, their rise to flame...I mean fame...and glittery glory ran parallel to one another. When Liberace hit Las Vegas as a performer, he landed in the Riviera - the first of its showy, sparkly kind on the Las Vegas strip. As his show got bigger, brighter, and more glam than glam rockers of the '80s could ever hope to be, so did Las Vegas. And both were wildly successful...beyond all reason. In fact, the Riviera was a subject of a famous Life article suggesting that Las Vegas had overextended its ability to sustain the number of hotel rooms it had built. And for 20 years, Mr. Showmanship was the highest paid entertainer in the world. I love Las Vegas. I lived there for 2 years - choosing to go to college there - because I love it so. I also love Liberace1. I love them both for precisely the same reason. Here are these massive, shiny, glamorous, show machines - lights! music! kitsch! excitement! energy! Both appeal(ed) to the mass market because both are/were like nothing anyone from middle America gets back home. Can't afford Gay3 Paris? Come to Las Vegas! They've got mutherf'in Paris, y'all! Can't afford the Big Apple? You don't need to go to NYC4! They've got the mutherf'in Statue of Liberty and a rollercoaster to boot! Liberace was the same way. He was Chopin, Mozart, Beethoven, Tchaikovsky - with the Las Vegas glitz and flare. Who needed the serious classical musicians when Liberace brought the classics to the middle American masses? Not middle America. That's for sure. Because there is something else about them both that is/was wildly appealing. Underneath the fur and rhinestone encrusted exteriors? IS middle America. And not just any middle America. A middle America rising from poor beginnings, laboring and toiling to boost themselves both up by the bootstraps. Both were full of BIG DREAMS and possibilities. And both capitalized on their appeal. So when I lived in Las Vegas and discovered the Liberace Museum was literally moments from my apartment on Tropicana near my grocery store of choice, you know I became a regular patron and dragged nearly every visitor I had to its grandiosity before leaving my company. The exterior of the museum - a part of a strip mall...because everything in Vegas is part of either the Strip or part of strip mall - was quite unassuming. It looks a leetle different now but, you know, whatever. Inside though...oh my lord the bling was blinding! And it was wonderful! And worth every penny. The economy has hit Las Vegas particularly hard. A city built upon disposable income and hope lost both over the last two years - just as the rest of the country lost income and hope. I suppose the extra few bucks for the museum seemed like a better investment going into the machines at Slots 'O Fun. Liberace is a legend. Just as much as Dean, Frank, and Sammie are legends. And the museum houses Liberace's legacy. 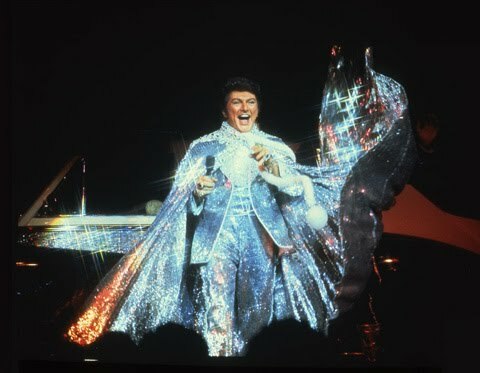 I don't think you can truly appreciate Liberace until you've seen his cars, his pianos, his capes. 50 years from now, will kids even know his name without the ability to get up close and personal with the stuff that made him famous beyond comprehension? I'm not worried about Las Vegas. Vegas will rebound again and again. But Liberace is dead. Only his legacy can bounce him back to a shadow of his former self. My response to the news? Save the museum. Won't you please? By the way? If someone loved me bunches and bunches? They'd totally buy me this. And then I would totally make them Liberace Sticky Buns. And the Classic Las Vegas History Blog. 1: I didn't live with Liberace. He died before I was of age. 2: I am, after all, a lover of all things cheese. 3: Not gay as in homosexual, Silly. Gay as in HAPPY! 4: "What is it about you? You're big! You're loud! You're tough!" Does Las Vegas have a Hall of Fame? I think it should. I don't believe so. At least, not that I've heard about. And it totally should.